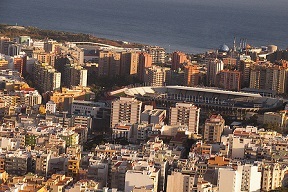 Santa Cruz de Tenerife, located on the northeast coast, is the capital of Tenerife. It’s a busy port city of nearly 190,000 people where few tourists bother to visit. Yet it has plenty to offer the day tripper or someone looking for a base to explore the northern region. It’s a cosmopolitan city with a well-deserved reputation for being the place to go if you’re in search of urban fun. One of the prime attractions of the Santa Cruz de Tenerife is its lively nightlife. Keep in mind that the night starts late in Santa Cruz, but when it does, it doesn’t stop! Things are pretty quiet until about 10pm but after midnight the streets fill up with people headed to the discos and pubs. Avenida Anaga on the waterfront is the area to head for. The summers in this part of Tenerife are hot and dry with daytime temperatures often reaching the 30ºC mark. There is little or no rain during these months though there may be the occasional summer storm which won’t last more than a couple of hours. In winter the temperatures are still very pleasant with many sunny days which allow locals and tourists alike to spend plenty of hours outdoors. As a rule winters are fairly dry but it does tend to be a bit wetter in this part of the island than in the south of Tenerife. Below is the Santa Cruz de Tenerife weather forecast for the next 4 days together with annual monthly temperature and rainfall figures. If you’re in Santa Cruz de Tenerife during the month of February you won’t be able to miss the city bloom into vibrant colour and wild partying. Carnival in Santa Cruz de Tenerife is by far the city’s most important annual event where you’ll find yourself participating whether you meant to or not! Accommodation becomes fully booked all over the island some time in advance so be sure to book early. Santa Cruz de Tenerife isn’t known for particular sights but rather for its overall ambience. However, there are a few places worth a special mention. The Palmetum of Santa Cruz de Tenerife is located in the Parque Marítimo César Manrique and is a huge botanical garden with one of the world’s largest collections of palm trees. Take a gentle stroll through the waterfalls, streams and ponds of the gardens and enjoy a relaxing escape from the afternoon sun. The main museum of note is the Museo de la Naturaleza y El Hombre which is dedicated to the fascinating geography of the island presented in various multimedia forms. 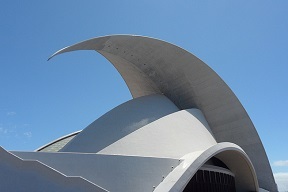 The city’s auditorium (auditorio de Tenerife) is also worth a look or book tickets for a classical music concert there. It’s a magnificent building designed by the renowned architect Santiago Calatrava and has become a trademark of the city of Santa Cruz de Tenerife. Shopping is a popular pastime in the city and centres on Calle Castillo and the other streets. There are often good deals to be had on electronics thanks to the island’s duty free status but you’ll also find stylish boutiques around with the latest fashions. Take a break at one of the open terrace bars in the attractive square of Plaza de la Candelaria. There’s a flea market on Sunday mornings on Calle José Manuel Guimerá. To get away from the city take a bus out to Playa de Las Teresitas. This is one of the island’s finest beaches thanks to its imported Saharan sand. It’s just to the north of Santa Cruz, along the coast near the village of San Andrés which is a great spot for fish restaurants. For a evening away from the city head inland to La Laguna which is a lively student town with some of the island’s liveliest nightlife.